It's perfect for building team spirit at cheerleading camp or providing a memorable keepsake at season's end. 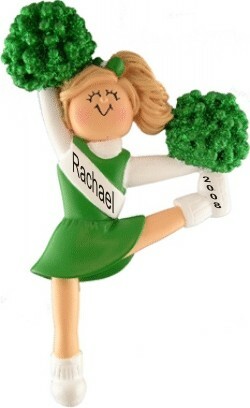 The cheerleader blonde w/ green uniform personalized Christmas ornament is also available in other uniform colors as well as brunette and African American styles. We attach a display cord to these sports ornaments personalized to make them special, and they arrive in individual velvet pouches. Hear the cheers from your squad when they see the blonde cheerleader with green uniform personalized Christmas ornament with their name across the front! One for each girl Nov 13, 2014 Annie T.